I came across the story of the Wales Window from watching an episode of Escape to the Country, this one featuring properties (and people) in Wales. At a time when tension, hostility and hate seem to feature so much in the daily news broadcasts, it is nice to learn about moments of friendship and caring, a ray of sunlight penetrating storm clouds. On Sunday, 15th September 1963, Robert Chambliss, a member of the KKK placed a bomb under the steps of the Sixteenth Street Baptist Church in Birmingham. 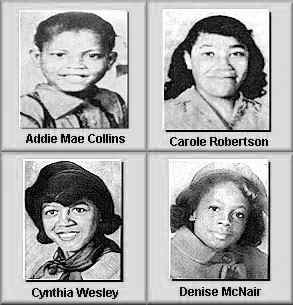 In the resulting explosion, four children were killed: Denise McNair (11), Addie Mae Collins (14), Carole Robertson (14) and Cynthia Wesley (14). They had been attending Sunday school classes at the church. 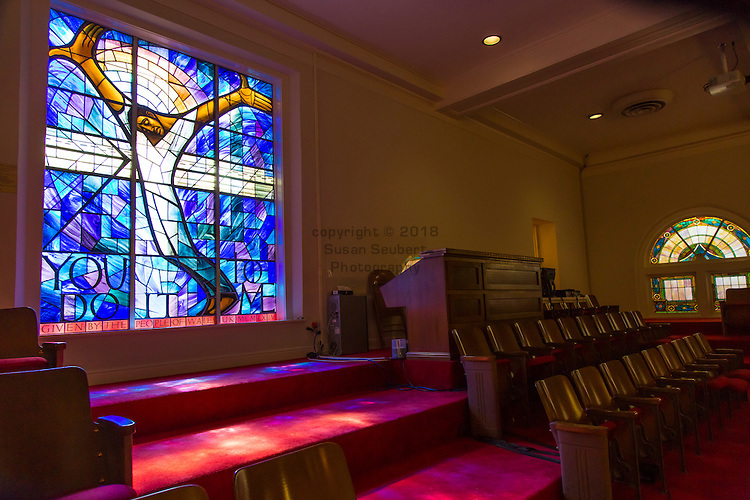 The church had been used as a meeting-place for civil rights leaders such as Martin Luther King, with tensions having risen when a campaign was conducted to register African American voters in Birmingham. 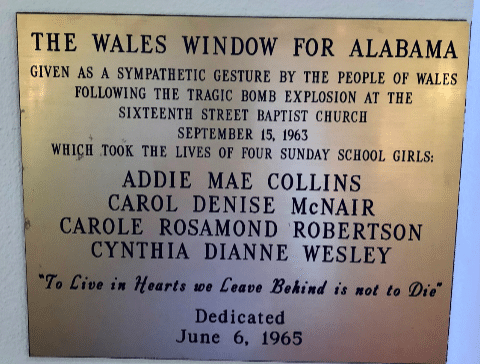 A week before the bombing, Alabama Governor George Wallace had told the New York Times that to stop integration Alabama needed a "few first-class funerals." Although a witness identified Robert Chambliss as the man who placed the bomb under the steps of the church, and despite possessing a box of 122 sticks of dynamite without a permit, he was found not guilty of murder and received a hundred-dollar fine and a six-month jail sentence for having the dynamite. As a result of reopening of the case by Governor Bill Baxley in 1977, he was tried again, found guilty and sentenced to life imprisonment. He died in prison in 1985. The target, 500 pounds, was quickly raised with Wales schoolchildren making many of the donations. Petts then travelled to Birmingham to meet with the church leaders. 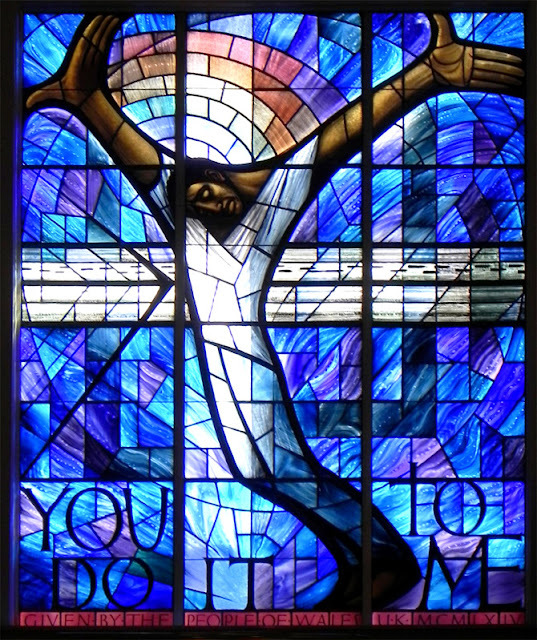 Petts wanted the theme for his window to be the words of Christ in Matthew 25:40, "Truly, I say to you, as you did it to one of the least of these my brothers, you did it to me." It was completed in 1964 and installed prior to the reopening of the church in 1965. In 1987 John Petts spoke with the BBC, commenting "They had never heard of Wales, they had no idea where it was, but they were very quickly told something of the little country Wales was, and how it put great value on independence and freedom, to bandy with the great big words. An idea doesn't exist unless you do something about it. Thought has no real living meaning unless it's followed by action of some kind." Petts’ window shows a crucified black Christ, superimposed over an abstract cross of white and light coloured glass against a blue field with a circle inscribed around it. As interpreted by Petts, the figure's right hand pushes away injustice while its left hand is open, offering forgiveness. A rainbow, representing diversity and God's promise, crowns the figure's head. 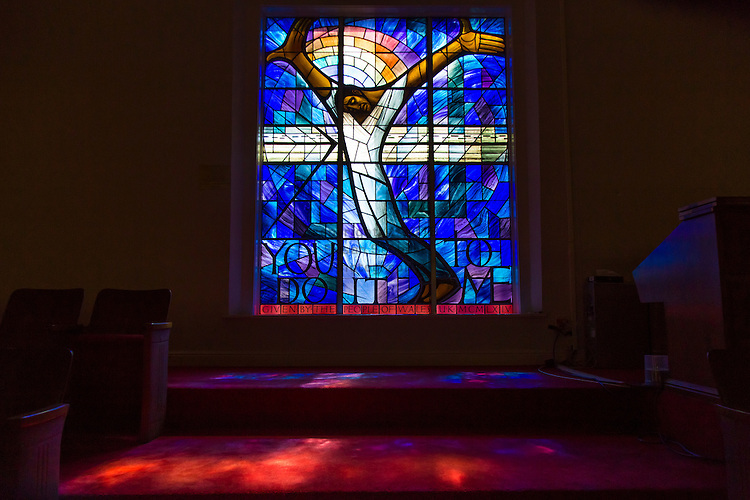 The figure of Christ is bent in the same pose as African Americans had been bent from the blast of a water cannon, recalling the demonstrations the previous Spring when demonstrators had been met by police dogs and fire hoses. At the bottom edge of the window is the dedication, "Given by the people of Wales, UK, MCMLXIV". The black Jesus was both a defiant and heart-warming image at a time when African Americans were seeking equality and civil rights. "The boldness - in this country - of having a black Christ speaks volumes. For the African American community that's not a stretch at all, but for many people in the white community during that time, to say that Jesus Christ was black and of African descent would be blasphemous. 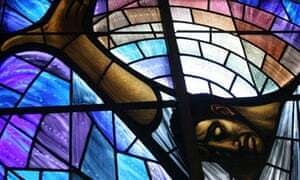 But I think the major message we try to take out of the window is not so much identifying Christ's colour but knowing that Christ identifies with us. To the white community this is that the Jesus you love identifies himself with the African-American community, so you are really crucifying him again when you persecute someone who does not look like you."